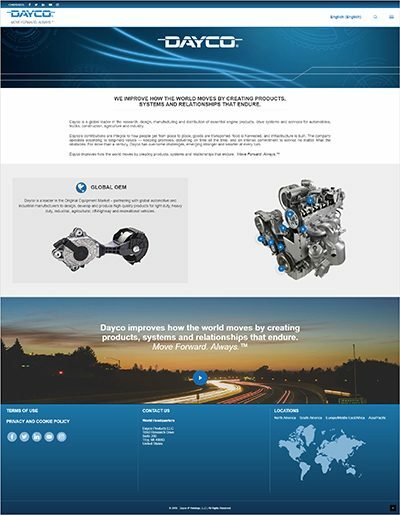 September 3, 2018 – Dayco, a leading engine products and drive systems supplier for the automotive, industrial and aftermarket industries, has completely redesigned its corporate and aftermarket websites to more accurately reflect its position as a leading global manufacturer of original equipment (OE) and aftermarket components. Digital interaction is the primary means of worldwide communication, so for Dayco and its many customers, these websites provide the ideal conduit to relay the huge depth of information Dayco holds to those that need it, when they need it. It is also the most effective way to portray Dayco’s revised corporate branding, which graphically supports its global identity, values and culture via powerful imagery and a uniform style. Alongside the ability to promote global recognition of the Dayco brand, the sites also need to deliver in terms of their content and ability to provide an enhanced level of service to Dayco’s existing and future customers. To ensure this objective was met, the sites have been designed to reflect the growing needs of those using mobile devices and thereby utilize the latest technology to seamlessly integrate with whatever platform – mobile, tablet or desktop etc. – users choose to access them. In terms of content, the new sites highlight Dayco’s growing product portfolio and many technical innovations. Dayco’s corporate site – www.dayco.com – highlights the company’s OE technological, design and manufacturing competences and its global footprint, which extends to more than 40 locations in 22 countries, as well as its significance to both the light and heavy duty sectors of the automotive industry. The aftermarket site – www.daycoaftermarket.com – focuses on providing technical information and support to Dayco’s many customers and to the technicians that install its quality OE components. This is done by incorporating videos and technical bulletins, as well as a comprehensive parts catalogue. Among its many benefits, this exceptional resource features multiple search options to offer users the most convenient route to locate the correct replacement item. In order to serve Dayco’s worldwide presence, these websites are accessible in the local languages for each of Dayco’s international manufacturing facilities, making them accessible for customers from all around the world. As a result, the corporate site is available in eight languages, reflecting its OE related facilities/main customers, whereas the aftermarket site can be accessed in 14 languages, demonstrating its multimarket aftermarket operations.